​A scoop of Southern Hospitality, a heaping cup of Native American drive, and a pinch of New Mexico spice, Diedra Rae is a well-rounded daughter of both a Spanish American farmer and an inner city Chef who grew up in the most culturally diverse city in Colorado. Diedra graduated with honors from Auguste Escoffier School of Culinary Arts in Boulder, CO.
Diedra’s passion for cooking developed as a child while helping relatives prepare traditional Spanish, Jewish and Native American dishes, canning fruits and vegetables, and baking breads and pastries. All of which were made from produce locally and directly harvested from the family farm and prepared on wood burning stoves in old-fashioned adobe homes in Taos, NM. Diedra credits her strong work ethic and values as a tribute to the legacy of her grandparents. While sharing decades of culinary passion and family secrets through her contagious “Do All Things with Love” motto and inspirational “Recipes for Life,” Diedra has a clear passion for “sharing the love” and the connection food creates between people, community and overall well-being. “I believe that regardless of our differences we are all on the same level when it comes to food. Food is an intimate and universal language that, we can all relate to...” Diedra elaborates. Diedra enjoys teaching, and spent the early years of her career as a Chef instructor coordinating, teaching and hosting Culinary Classes for the community though Culinary Kids (a non-profit organization), as well as mentoring, tutoring and acting as a guest motivational speaker to Pastry Arts students at Auguste Escoffier School of Culinary Arts. Diedra enjoys donating her time by participating in the Annual Blind Taste of the Rockies each year in support of the Foundation Fighting Blindness as well as Christian World Outreach. In such a short time has experienced a wide variety of areas in the culinary and pastry industry. Refining her creativity and skills designing artistic custom cakes for special events, weddings, corporations as well as marketing materials. She assisted in the opening of the new Sur La Table in Southglenn in 2014 and was a highly rated chef instructor teaching interactive and educational on-site culinary classes to adults and children. 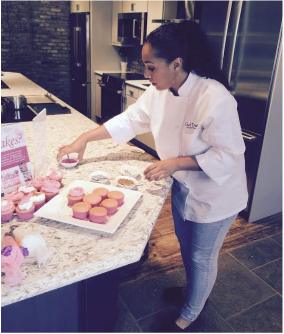 Diedra spent three seasons as a Private Chef for Denver Nugget, Ty Lawson up until his trade to the Houston Rockets in 2015, and continues to serve high-profile Colorado Athletes and Clients throughout Colorado; you'll also find her conducting weekend product demonstrations at Mountain High Appliance for luxury appliance lines Dacor and Bosch. Chef Diedra Rae is Certified by ServSafe for successfully completing the standards set forth for the ServSafe Food Protection Manager Certification Examination. This is accredited by the American National Standards Institute (ANSI) and Conference for Food Protection (CFP).